Table for one–the most mortifying of phrases in my book, is something I have tried to evade. A geek to the core, one might say–most of my younger years were spent being in a relationship. Now that I am single, this act takes some getting used to. In an attempt to somewhat “lighten the blow”, I find pleasure in creating a “table for one” in the privacy of my own home. Call it paranoia, but I feel like the demographic of a restaurant pities that of the lonesome eater. 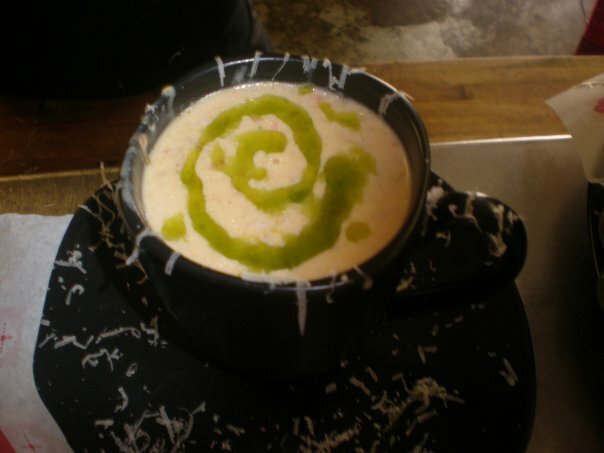 Last night, I decided to bring to life a very special soup that I served at a past restaurant–roasted red pepper and asparagus bisque, garnished with a chive oil. This is something that not only comforts me, but also, avoids dining alone in a public setting. Moreover, it suppresses my yearning to take a bath with the toaster (insert sarcasm here). Again, this is a recipe that I can’t part with. Only my culinary husbands William, Corby, Matthew and John will be able to experience the comforts of this soup. However, not to be discouraged, be creative and playful in the kitchen. Pick a form of produce that is in season and give it somewhat of a face-lift–for instance, cauliflower. Nonetheless, pick your favorite soup recipe and get cooking!